It is a truth universally acknowledged that a music album enjoyed by children must be unpleasant for adults. What parent hasn’t been trapped in a car with a children’s album slowly driving them mad? For over 12 years, Randall Goodgame has been spoiling this stereotype. 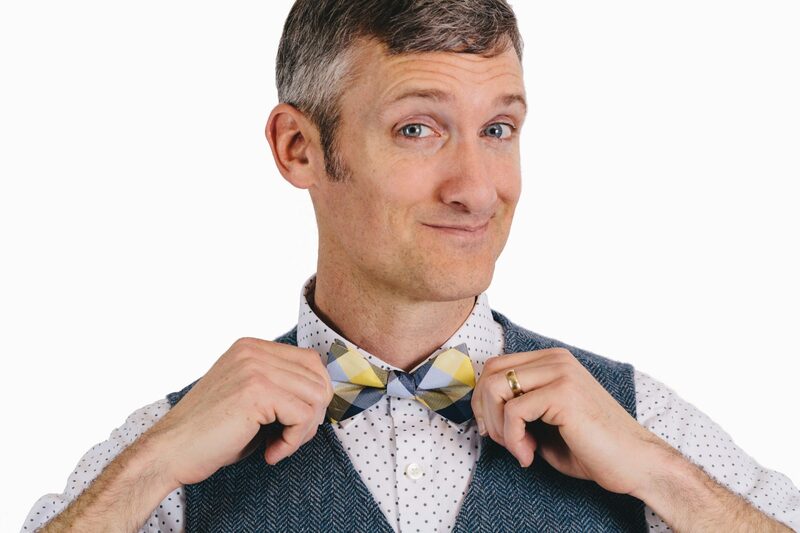 The Nashville-based singer/songwriter delights children with his humor and clever writing—and delights parents, too, because at last they’ve found music that is enjoyable and profitable for everyone. Originally from Florida, Goodgame was a successful solo artist early in his career as well as a writer for Caedmon’s Call, among other bands. In 2007, he and Andrew Peterson released Slugs & Bugs & Lullabies, a joint project of songs they’d written for their own kids. Goodgame then went on to compose music for Veggie Tales and release more children’s music, keeping the “Slugs & Bugs” moniker. In 2015, he released an album of 18 songs directly from Scripture. Sing the Bible with Slugs & Bugs was nominated for Children’s Music Album of the Year at the Dove Awards. He’s since followed it up with two more in the series, including one that revolves around Christmas (Sing the Bible Family Christmas). The Sing the Bible series has been well received by families, as they see their kids easily memorizing verse upon verse of Scripture. More than that, it’s obvious Randall desires to help children understand God’s heart in the gospel. 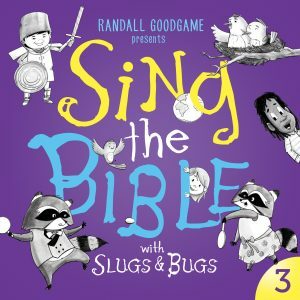 Randall has just released volume 3 in the Sing the Bible series. This album features guests such as Bart Millard (MercyMe), Mike Weaver (Big Daddy Weave), Sara Groves, Andrew Peterson, and spoken-word artist Propaganda. Bestselling author Sally Lloyd-Jones, of Jesus Storybook Bible fame, also makes an appearance, as she has on other Slugs & Bugs albums. I asked Randall some questions about his experience as a Christian musician for kids. What is the role of Scripture memory in your home and in the discipleship of your children? Our kids know a lot of Scripture from the Sing the Bible CDs and from singing those songs during family worship time. We talk about God’s presence in our lives as a profound mystery, and my kids understand that studying and memorizing Scripture is foundational to engaging with that mystery and embarking on the lifelong journey of fellowship with the Holy Spirit. Our family is like most families I encounter on the road with Slugs & Bugs. We all want our children to learn more and grow deeper in their knowledge of the Word. Some months we are consistent and intentional, with printouts and verses on the chalkboard, and some months we are lucky to remember to put in a Sing the Bible CD. I’d say the one thing we’re consistent with is returning to the Word, whether it has been a few hours or a few weeks. How can the local church better support artists and musicians? Great question. Start by listening to the church body. Pastors are busy, worship leaders are busy, so they lean on the same resources they’ve always sought. However, because great art and music isn’t institutionalized like it once was, the church can be blind to what else is out there. The church body—the members—aren’t shy about telling church staff about their favorite artists. But it’s up to the staff and lay leaders to listen and then begin to use or share what inspires them, with discernment and humility. And of course, they should pray. Pray for an artist and his or her family. This “artist journey” is fraught with sinkholes, both material and relational. Consider bringing in an artist for a concert and then promote it enthusiastically inside your community. Consider commissioning a painter for a work of art to display in the church building, or promoting an artist’s work to the congregation. Make June “Adopt an Artist Month.” Choose one artist who has influenced your church and encourage all your congregants to support that artist with a purchase from their website or store. This would bless the artist and the congregation. But even more, by acknowledging the value of created beauty within the family of God, we become more appreciative of the miraculous beauty of our Creator. How do you integrate humor in your songs that appeals to children without being childish? For the sake of this question, let’s discern between childish and childlike. If childish is throwing a temper tantrum or throwing food on the floor for fun, then childlike is laughing at a dandelion in the breeze or never worrying about what your hair looks like. The joyful, carefree, utterly dependent nature of a child is, I believe, at the core of what Jesus is talking about in Luke 18:16–17. Humor that comes from that childlike place will appeal to adults as well as children, since it appeals to the core of our identity in Christ. Humor that comes from a childlike place will appeal to adults as well as children, since it appeals to the core of our identity in Christ. How has writing, singing, and touring for Slugs & Bugs influenced you? Also, being around children so much has given me a deeper appreciation for God’s love for me, his infinite grace, and my place in my Father’s eyes. At almost every Slugs & Bugs concert there is a child losing his mind. Maybe he missed his nap. Maybe she’s hungry. Maybe the music volume is just too much, or maybe I didn’t play “Tractor, Tractor.” Whatever the reason, it always reminds me of how I feel when I’m upset or angry, and it seems like everyone else is having a great time with no troubles while I’m the one kicking and screaming. In those situations—every time—there’s a mom or dad who scoops up the screaming kid into their arms, embracing them, cradling them, stealing off to a quiet place to speak soothing words of comfort. That’s what God does for me, and I’m so grateful for all those children and parents who shine that light of Christ for me. And of course, because of the Sing the Bible series, I have soaked in the Word more deeply and consistently than I otherwise would have. I’ve meditated on and memorized hundreds of passages, a blessing I didn’t anticipate when I set out with the calling to serve families through music. But the depth of that blessing is fathomless. Different Scripture passages come to my mind throughout the day as I’m wrestling with one issue or another, or when I’m sharing in confidence with a friend, or with no obvious provocation at all. Finally, in many verses the songs themselves have helped me grasp a depth of meaning that would’ve otherwise remained hidden. I’m not sure I have the words to articulate this, but as an example, there’s a song on our new Sing the Bible Volume 3 CD usins Ephesians 2:8–10. I can read the passage out loud with no trouble at all. But in the song, when I sing the second verse—”nor anything else in all creation shall be able to separate us from the love of God that is in Jesus Christ our Lord” (quoting Romans 8:39)—I can hardly get through it without crying like a baby. Something about the addition of music and melody can bring a different, visceral understanding of Scripture. I wonder if it’s connected to Paul’s prayer to the Ephesians that they would “know this love that surpasses knowledge”? I definitely don’t think the reaction is purely emotional, though given the opportunity, our emotions will most definitely testify to the love and power that passage reveals. Kelly Keller is a homeschooling mom of five, wife to David, and member of Oakhurst Baptist in Charlotte, North Carolina. She’s a contributor at Story Warren.